Here it is, my very first ice cream made with my brand new Cuisinart ice cream maker and I couldn't be happier! Banana ice cream is Will's all time favorite, and as I mentioned before he was such a naysayer when it came to getting an ice cream maker (he thinks that I will make 2 flavors and the novelty will wear off - eye roll), that I thought I better try to win him over with his favorite flavor. As I placed the ingredients into the machine Will says "Oh honey, how do you feel? This is your dream come true." - again insert eye roll here - he is such a man. Yes it WAS a dream because I was going back and forth about an ice cream maker for YEARS. Once he started to see the liquid mixture beginning to transform into actual ice cream some of his reluctance began to fade. He said "Oh, it's looking like ice cream!". When it was all finished and before I put it into the freezer for a bit, I gave him a taste and he said "Oh my gosh, this is the best thing you ever made!" I knew at that moment I had him hooked! As I told Katrina at Baking And Boys, I now only have 1,534,000 more flavors to make before he completely eats his words about me buying an ice cream maker! It really is delicious. Hope you enjoy it as much as we do! 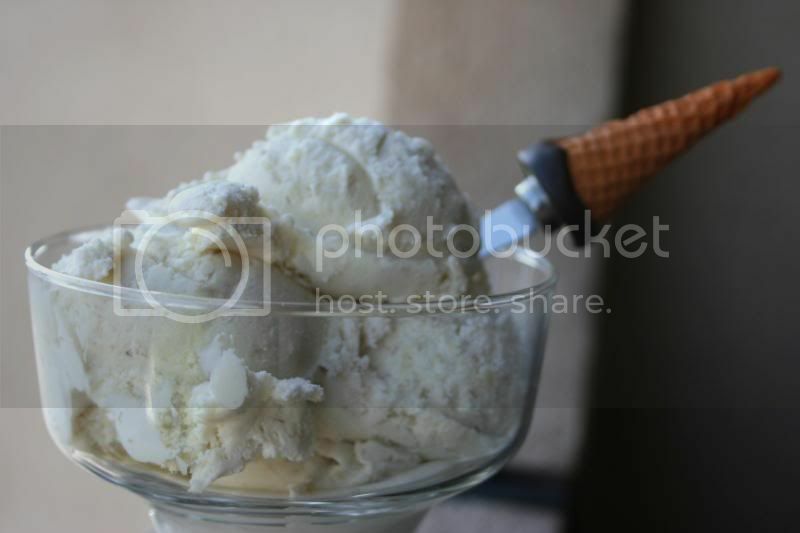 1 inch split vanilla bean (optional) - I did not use the vanilla bean, simply because I did not have one on hand. Add whipping cream, whole milk, and vanilla bean in a pan and simmer for 15 - 20 minutes. Stir constantly and do not cover. In a separate bowl mix the eggs and sugar until well blended. After the cream and milk has been simmering, take out the vanilla bean (if you are indeed using one) and add the egg/sugar mixture to the pan, maintaining the simmer and the stirring. When this begins to thicken (approx 3-5 minutes) remove from heat, cover with plastic wrap (tight to the mixture), and put in the fridge until completely cool. The original recipe asks you to dice the bananas and then put the entire mixture into a blender but with two kids on a holiday who has that kind of time? So I just added 2 ripe mashed bananas to the mixture when it was completely cooled. At this point place mixture into the ice cream maker and process according to manufactures directions (for my Cuisinart, I let it spin for 20 min). During this time you could add in extras such as chocolate chips or whatever your heart desires, but Will wanted just plain old banana ice cream so I didn’t add anything additional. Mine was the consistency of soft serve ice cream when it was done in the machine - which was still great, but since I knew I wanted to blog it, so I put it into an air-tight container and placed it back into the freezer overnight (I don't think you would really need to wait longer than a few hours though, I just ran out of time yesterday). 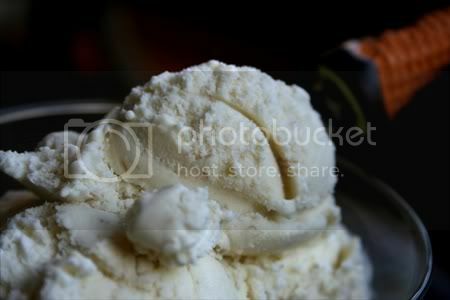 Today as you can see in the picture, it is the consistency of hand dipped ice cream. It will make just less than 2 quarts. Mine is a 1.5 quart maker and I didn't have any problems with it all fitting in. My first ice cream was a banana one, too! That's funny. Although it was a healthy one and I'm pretty sure my husband didn't even taste it. I WANT this. Looks great and I know I'll try the recipe. 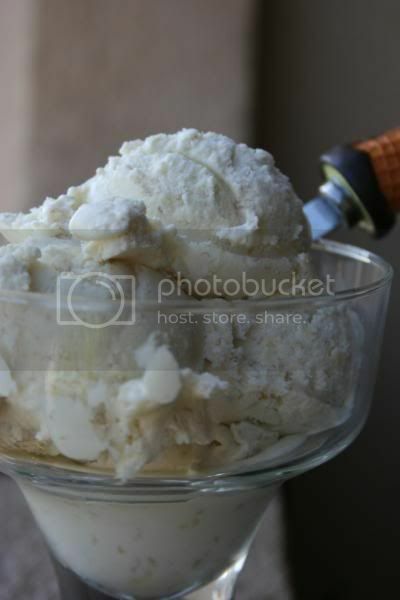 I love bananas and just add them to ice cream, hello--heaven! oohh that looks yummie. I have a smaller sized one..a 1 quart so Im going to tweak the measurments and give it a whirl. Sonya, keep me posted on how it goes! Katrina, I think you and I think A LOT alike! You'll have to let me know how you like it and walnuts on top sounds like a great addition! (Will is allergic to nuts so I'll have to live vicariously though you on that one!) As for the shout out, glad to do it as you have an amazing blog! I found it odd that I decided to post my comment as Katrina did in 2009, the day after the 4th. It was excellent, I added Mascarpone, if I'm going to cheat I want to cheat with something extraordinary. This was a fantastic recipe.